1. Clean the Exterior: Rent or borrow a power washer to thoroughly clean the outside of your home, including the deck. While you’re washing, check your deck for molded or water damaged spots—which could lead to worse problems—and your foundation for cracks. If cracks are extensive, get a professional opinion. 2. Tidy Up the Landscaping: Snow and ice can cause branches to break, so check the trees surrounding your home for falling limbs. This is also a good time to pick up any sticks that have fallen before you start mowing this season. 3. Clear out the HVAC Unit: Sometimes leaves, sticks, dirt, and other debris get caught in your heating and air conditioning unit over the winter. Disconnect the unit from power before removing debris. 4. Clean the Interior: After a winter full of muddy shoes, now is a good time to have your carpets cleaned! Hire a pro or do-it-yourself. This is also a great time to give the windows a good washing and touch up scuffs and scratches on the walls with fresh paint. Don’t forget spring is just about the best time of year to sell your home! If it’s time to find your next home, contact me for a complimentary consultation. I offer unparalleled marketing both online and in print and offer FREE home staging—including furniture and accessories! Call or email me today. 1. Replace the kitchen and bathroom faucets. Still using the same faucet from twenty years ago? Get something stylish and attractive! It will make a big difference in your kitchen and bathroom. 2. Update your living room or dining room light fixtures. Light fixtures have incredible power--they can turn a dim, unwelcoming room into your home's best room! Similarly, a contemporary light fixture can completely change the look of your home from dated to distinctive. 3. Upgrade the handles and hinges on your kitchen and bathroom cabinets. I prefer a nice long handle to a knob. It has a more sophisticated look and they come in all kinds of styles. 4. Replace your outlets and outlet covers. Many older homes have off-white or even beige outlet covers, which have a very dated look. Change to a bright white to take ten years off your home. 5. Paint. Of all simple projects, painting is the most transformative. Choosing neutral, soothing tones will updating your home and create a more appealing atmosphere. It's easy as long as you have the right tools--painters tape, drop cloth, good quality paint, and good quality rollers and brushes. New Year's Resolution for Your Home #6: get out your tools and do-it-yourself! DIY is a great way to increase the value of your home and save money. There are tons of online resources for DIY, but nothing beats hands-on instruction from a professional. The Home Dept offers a variety of workshops included regular weekend classes, "Do-It-Herself" classes, and classes especially for children. All are FREE! Can't make it to one of the classes? Check out the extensive library of DIY projects here at The Home Depot Project Guide. If you're thinking about selling your home, don't underestimate the value of a few simple projects to make your home look the best. You can check out my Seller Tips to see more ideas on increasing the value of your home. 1. Habitat for Humanity Restore, 1303 Jamestown Road, Williamsburg VA.
2. Aladdin Consignment, 7131 Merrimac Trail Williamsburg, VA. There are plenty of online options as well. Auction, classified, and multi-vendor sites often offer free shipping or promotional codes. Before ordering, Google “Promo code for …”, inserting the name of the site. Often you’ll save 10% or more just by surfing the web for discount codes! 1. www.amazon.com --both new and used items. Great customer service and easy returns! 2. www.Ebay.com --both new and used item. Check with each vendor for return policy. 3. www.Freeycle.org --absolutely free items from local individuals. 4. http://norfolk.craigslist.org/ --mostly used items, offers from locals. Also has a listing for "Free" items. 5. http://www.vagazette.com/classified/ --Williamsburg's local newpaper offers these classified ads. You can have fantastic curb appeal without spending a lot of time on your yard. All it takes is a little planning and the right plants. When you’re choosing low maintenance plants, look for foliage or flowers that fit with the natural surroundings of your home. If you live in an area prone to drought and heat (here in Williamsburg the summers are hot hot hot! ), choose plants that require full sun and well drained soil. Williamsburg is also surrounded by three rivers and lots of wooded areas, so you may find that your soil is often waterlogged or shady. If that’s the case, be sure to choose plants that love moisture and shade. For long term low maintenance landscaping, choose self-propagating perennials. These types of plants will return year after year and, multiplying on their own. 1. Daylilies are some of the best low maintenance plants. Developing huge, colorful blossoms and large bushes of foliage, daylilies can be grown in full sun or partial sun. Even in shady areas, daylilies will grow, but the number of blossoms will be fewer. For partial shade, choose a daylily variety with a darker blossom. 2. 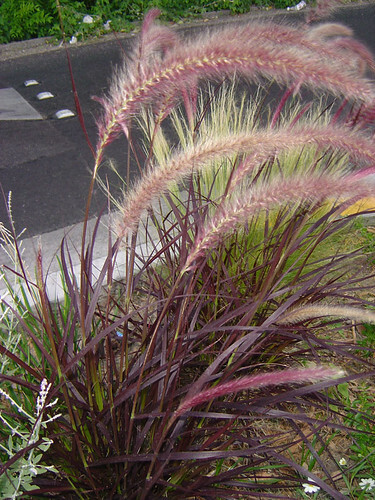 Purple fountain grass provides a pop of unusual color even in dry conditions. 3. Creeping thyme is a great ground cover, aromatic plant, and a tasty herb to boot! Happiest in acid, well-drained soils with full sun, these flowering plants seem to thrive in poor soil conditions. 4. 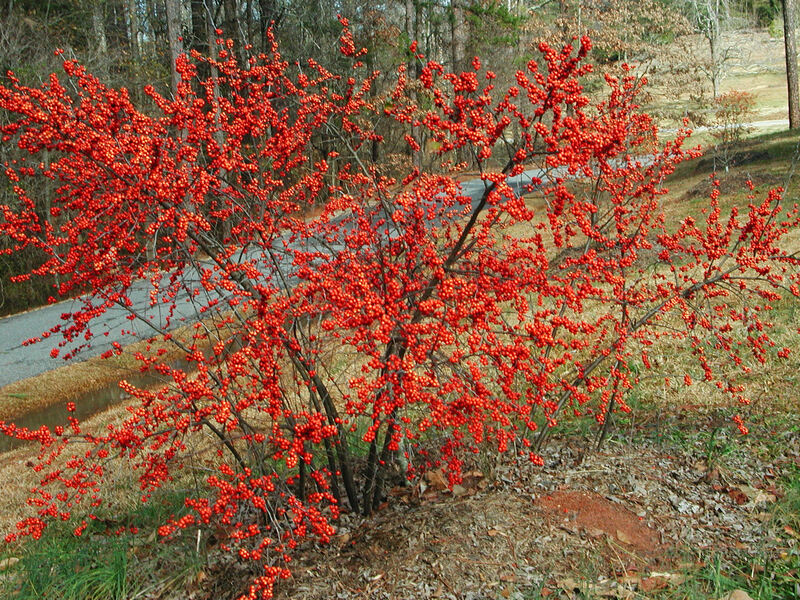 Winterberry holly shrubs do well in wet soils. Producing more berries in full sun, but still thriving in partial sun, this shrub attracts songbirds! Recently a friend of mine decided to host her family for the holidays. She quickly found out that her kitchen wasn’t equipped for a large group of people. She didn’t have enough dishes, a turkey roaster, serving bowls, or 10 settings of silverware. Even her table was too small! In her house, she didn’t have the space to store all of these items, so she committed to borrowing. She threw a great holiday party with plates and silverware loaned from her mom, a folding table borrowed from a friend, and a turkey roaster from her sister. She saved lots of money and tons of storage space! But the main reason borrowing was successful was because she practiced good borrowing etiquette. And when you borrow, your house remains decluttered. It’s a win-win! Here are some borrowing etiquette rules to help you commit to borrowing this New Year! 1. Take excellent care of the item. If you’re borrowing a book, don’t use it as a coaster or do gear the pages. 2. Return the item in better-than-you-got-it condition. This includes filling up the tank on the lawn mower, washing that casserole dish, and dry cleaning formal clothing. 3. Return it promptly. If you end up needing it for a longer amount of time that you planned, let the owner know right away! Don’t be offended if they ask you to return it on time anyhow. 4. If (heaven forbid!) the borrowed item is destroyed or lost on your watch, replace it immediately! 1. Don’t over plan. Yes, you’d love to leave the kitchen sparkling every night but if that’s not feasible, making that goal will only discourage you. Instead, commit to goals you know you can manage and leave some flex time in your schedule for the unexpected. 2. Delegate. There’s no reason your spouse or kids can’t share in the work. Give your family a chance to choose what chores they would prefer, and then have them commit to a time (either daily or weekly) that they will complete their chores. 3. Organize. Keep all your bathroom cleaning products together, preferably in the bathroom. Ditto for kitchen cleaners. If possible, keep the vacuum cleaner, duster, mop, broom, and similar items together so you can reach them easily and quickly. 4. Use a timer. Something about being on the clock makes work go more efficiently. Try setting a timer for 15 minutes and cleaning the bathroom. You’ll be amazed at the results! 5. Write it down! 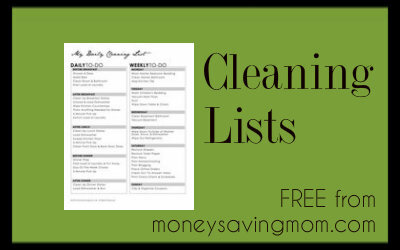 Use these handy cleaning charts to assign chores and create your cleaning schedule! 1. Get Your Supplies: Grab a trash bag, a laundry basket, and a timer. In order to declutter, you’re going to throw stuff away in the trash bag and put things that belong in other rooms in the laundry basket. You’ll use the timer to make sure you stay on track. 2. Pick the smallest/easiest room first: The coat closet, bathroom, or foyer are great places to begin. Small rooms can be decluttered quickly, and the success will motivate you to continue to more difficult areas! 3. Set the timer for five minutes and grab everything that doesn’t belong in that room and put it in the laundry basket. 4. Set the timer for five more minutes and put all the trash in the room in the trash bag. 5. Set the timer for 10-30 minutes (more time for larger rooms) and get rid of that clutter! Anything that you don’t like, don’t use, or simply don’t need, get it out of the house! At this point, everything left in the room is usable (because you threw out the trash, remember?) so anything that you eliminate can be sold on Craigslist, in a yard sale, or donated to charity. 6. Don’t sit down just yet! Take out the trash and put away all the things in the laundry basket that go in other rooms. Take care to put them away where they belong or you’ll just have to put them right back in the laundry basket when you start decluttering the next room. 7. Congratulate yourself! You’ve decluttered a room in your house and it only took you 20-40 minutes. Check out the difference decluttering made in this home!